What is Umbilical Cord ? The umbilical cord is the connecting cord from the developing embryo to the placenta. During pregnancy it carries oxygenated nutrient-rich blood from the placenta to the growing fetus. After your baby is born, the midwife clamps the cord, cuts it and then leaves an umbilical stump. This is a painless procedure as there are not any nerves in it. When will it Drop off? The umbilical stump remains until it dries and drops off. This procedure may take 7–10 days. Keep the area around the base of it dry and clean. Some pediatricians recommend to rub alcohol around the base of the stump two or three times a day to speed up the drying process while others suggest to let it dry on it own. Why there is a controversy about the care of it ? According to a study published in 1998 by Hamilton Health Sciences Corporation in Ontario, Canada, the stumps that were left to dry on their own fell off in eight days while those rubbed with alcohol fell off in ten days. They also found that none of the infants who participated in the study developed an infection. Avoid covering it. Fold the top of the diaper down so that the umbilical stump is exposed, or use a newborn diaper with a cutout for the stump. 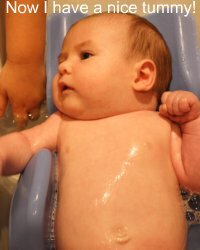 In order to let air circulate and speed the drying process have your baby wear a diaper and loose T-shirt. It is recommended to give your baby sponge baths until the stumps drops off. After that you can give your baby a tub baths. Never pull off the stump even if it looks like it is hanging by a thread. The area around the cord is red and swollen. Yellowish pus appears at the base of the stump. There is a foul-smelling discharge.